Certain men love the cool, quick and comfortable feeling after using their beard trimmer or electric shaver. The Philips RQ1195/17 functions perfectly well, saving you time and providing great result. For a more leisurely and refreshing shaving session, this product allows you to use your electric shaver with foam, cream in the shower, or do a dry shave without any creams, if you prefer. Unlike standard shavers which leave behind numerous unshorn hairs and stubble, the Philips Series shaver uses a special, two blade Super Lift as well as a Cut system, getting rid of each hair and reaching just below your skin level, making sure that even the shortest, most hard hairs are eliminated. This would also work well as an electric shaver for heads, because of the Gyroflex. The more flexible the heads are the better is would allow for a good shave on your head. There is nothing as amazing as a close shave. However, if like other men you have issues with your skin; shaving too close can make your neck and face itchy, red and also bumpy. 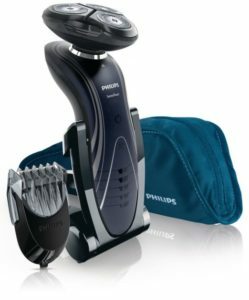 Philips is a reputable firm and is known for using high end technology to make its shavers. They completely understand that a good shave is just as much about preserving your skin on your face as it is getting rid of the hair. That’s why the company uses special technologies such as SkinGlide as well as GyroFlex 2D. The SkinGlide is meant to reduce friction between the machine and the skin, allowing the shaver glide smoothly against your skin. On the other hand, the GyroFlex 2D lets the machine automatically adjust to the contours of your jawline, cheekbones, the neck as well as the moustache area, curbing irritation and pressure. Maybe you love cleaning your face every time. If you enjoy altering things and have grown out a beard, the styler allows you to maintain anywhere between 0.5 to 5 mm of clean and tidy facial hair. Unlike the comb guards in so many other cheap clippers, the clippers for this machine is fully adjustable and comes with rounded plastic tips to inhibit skin irritation. It comes with a UK 2-pin plug. There are many brands out there that sell shavers but Philip manufactures some of the most trusted shavers on the market. A lot of their grooming tools are designed and manufactured by professionals who take highest standard of quality seriously. If you buy the Philips RQ1195/17, you will appreciate that shaving dry with the machine is still a comfortable experience. However, the company doesn’t state how long the integrated rechargeable battery survive, but according to reviews experience, it takes one hour hour to charge and functions for nearly as long. Depending on how much time you take to shave your hair, that will give you anywhere between five and twenty minutes. This electric shaver does not have any fancy tricks up its sleeve. But it offers a clean, close, comfortable result and represents solid value from one of the best grooming organization in the world. Its retail price is around £200, but it goes for about £95 currently online. It has 4.1 out of 5 in reviews, with over 77% of reviews being 4 star or higher, and just right around 10% giving it 2 stars or less.